Anyone driving a car (or truck), making mortgage payments and trying to put food on the table these days knows how important it is to squeeze value out of everything you buy. Obviously, Arctic Cat is listening because the product planners have come up with an ATV that brushes mighty close to the "too good to be true" category. The VLX 700 exceeds in so many categories and has a price so low ($5,999.00 USD, $7,199.00 CDN) it actually competes with the cost of ATVs two categories below it. Certainly, the starting point doesn't include Cat's latest Alterra bodywork or mechanicals. It does, however, find its foundation in the most recent iteration of Arctic Cat's former 700 chassis. This platform is still in use in Cat's lineup with the big-inch 1000 XT V-twin and both Mud-Pro models, the 1000 and 700 Limiteds, so it would be wrong to call its underpinnings obsolete. Its torque-blessed 695cc SOHC single is a strong, proven engine that generates plenty of grunt and decent top speed. This H1 EFI-equipped engine is assembled in Cat's own state-of-the-art engine plant in St. Cloud, Minnesota and there are thousands of them out there. Value pricing shouldn't mean reliability compromise and the VLX has the potential to be as tough as an M1A2 Abrams Tank. Over the years we've had plenty of opportunity to ride the VLX's ancestor, the XT 700, and we can tell you its selectable 4WD system is very good and its Duramatic CVT is well-thought-out and efficient. Like the Yamaha Kodiak, this CVT uses a sprag clutch. The belt is turning even at idle so when the sprag kicks in there’s minimal stress or potential for scuffing the drivebelt. Ground clearance has always been a big deal with Cat and the VLX offers 11-inches of it and ten inches suspension travel at each wheel. Hydraulic shocks with spring preload adjusters are used and there are no anti-swaybars. Cat has recently gone to using swaybars on some of its models but the VLX doesn't. For many years they claimed using a swaybar interfered with the "independent wheel movement" of each individual A-arm. This meant stiffer shocks and a somewhat compromised ride compared to some of the plusher competition. To be fair, Cat has tweaked its suspensions over the years and ride compliance is less of an issue than it once was. There are a few other downgrades but they are counteracted by some upgrades. Yes. The dash pod looks pretty bare with no instruments. Instead, there's a series of gear selection lights that tell you if you're in Park, Neutral and Reverse and if your engine is overheating. The counteracting upgrade is the use of aggressive-looking Carlisle TrailPro tires and black, styled steel wheels. Although these wheels are cheaper than aluminum ones, they are tough and, with the current trend toward dark wheels on trucks and cars these days, they look very up-to-date. The VLX constitutes such good bang-for-the buck we don't need to belabor its value. 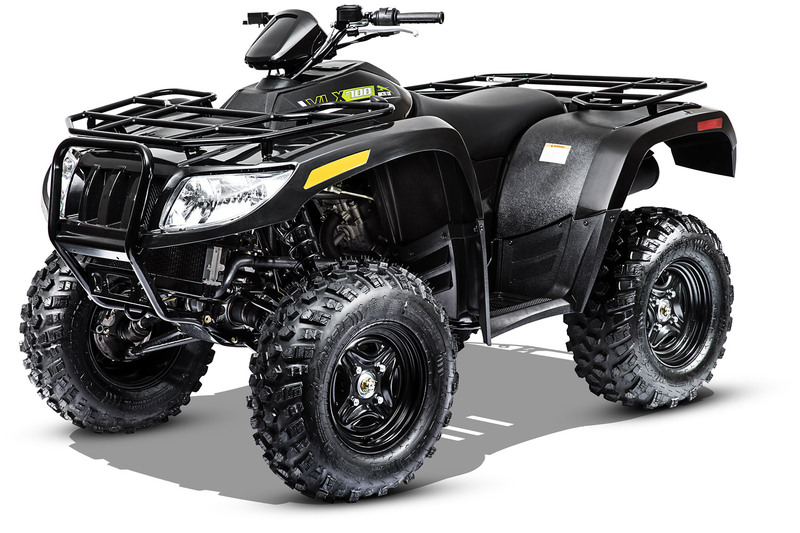 If you're hunting down a reliable, strong-performing, thoroughly equipped ATV at a ridiculous price, it just doesn't get any better than this.